Microdermabrasion: What is it? Why do we love it? Every woman wants to look youthful and age gracefully. Though, unfortunately, sooner or later, everyone has to face age-related changes in the skin, which first become noticeable on the face. Wrinkles, pigment spots or other cosmetic defects appear on our skin, depending on our lifestyle, genetic predisposition and individual characteristics of the body. Anyway, it’s impossible to avoid aging. However, thanks to the achievements of modern cosmetology, this process can be slowed down. Nowadays, we can find a great number of techniques that allow us to hide or even completely eliminate negative manifestations, return smoothness and radiance to our skin. And one of such methods is microdermabrasion. 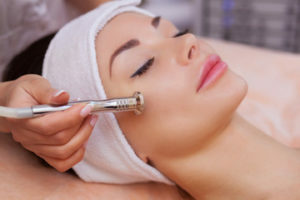 Microdermabrasion is a non-surgical rejuvenation of skin, that is, cleansing the face of the “dead” skin cells with the help of peeling performed by the apparatus. The aim of this manipulation is to take away the upper stratum corneum of the skin. The keratinized cells, which give the face an unaesthetic appearance, are removed. It also improves blood circulation under the skin, which favorably affects the synthesis of collagen and elastin. As a result, your skin acquires healthier appearance and a gentle natural blush, it also looks younger. High efficiency and absolute painlessness are distinctive features of microdermabrasion. great effects with: coarse skin; acne; expanded pores; increased fat content of the skin; loss of skin elasticity; age changes; age-related pigmentation. Moreover, microdermabrasion is possible for all skin types. It’s effect becomes noticeable at once and then it continues over the next few days. What about Contradictions to Microdermabrasion? you are inclined to the formation of keloid scars. So, do not deny yourself the pleasure of having fresh and radiant skin. Try microdermabrasion along with other skincare treatments at Hidden Trails Skincare and you’ll get high-quality professional care, the best customer service and, of course, great skin!